American WWII Artillery and Howitzers Used in Combat! Artillery is used against either tanks or infantry, often using armor piercing (AP) rounds, high explosive (HE) rounds, or smoke (used to provide cover). Another type of shell was White Phosphorous, also known as Willy Peter. Artillery is most effectively used in indirect fire, which means the guy firing the gun can't see the target. A spotter must direct the fire (as in the episode "Billy the Kid" and others). The 37 mm anti-tank gun was the standard US Army issue at the start of World War II. It was ineffective against most armor and was eventually replaced by the 57 mm anti-tank gun during the war. 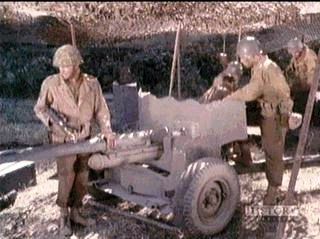 The 37 mm artillery piece is the gun that the men capture and carry in the episode "The Gun" (pictured above). Many of these weapons can still be spotted in front of VFW and American Legion Halls. Many scenes of American artillery in Combat! are of a 105 mm Howitzer. Six Howitzers were assigned to each regiment.  This was the most commonly used artillery weapon. A larger piece was the 155 mm Howitzer (very long barrel), used on division level. Large mortars and anti-tank guns are specialized types of artillery; a tank is basically a mobile artillery gun. ("Ambush," "The Duel" etc.). Artillery was known as the "King of Battle."